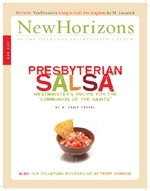 Presbyterian Salsa: Westminster's Recipe for the "Communion of Saints"
If the French are right that "the sauce is everything," it took Latin cuisine to prove it. Salsa (Spanish for "sauce") has become the leading condiment in the world. How can plain ketchup compare with the combination of hot and spicy peppers, with their varieties of fruity, smoky, and woodsy tones, along with tomatoes, onions, cilantro, and lime, to create just the right panache of zest, aroma, and finish to perk up any palate? It's Sunday morning. You wake up, prepare a hot beverage, eat breakfast, and finish your morning routine. Now what? Go to church? Maybe, maybe not. Attending public worship services has become optional for a growing number of professing Christians, as has commitment to the visible, institutional church. As the modern "home church" movement continues to gain momentum and threaten the peace and unity of congregations in every denomination, it behooves all who love Christ's church to speak the truth in love to home church advocates.